Ta-da! Here's the second of the two re-purposed shirt quilts and I am IN LOVE. The navy solids are new but everything else is repurposed. 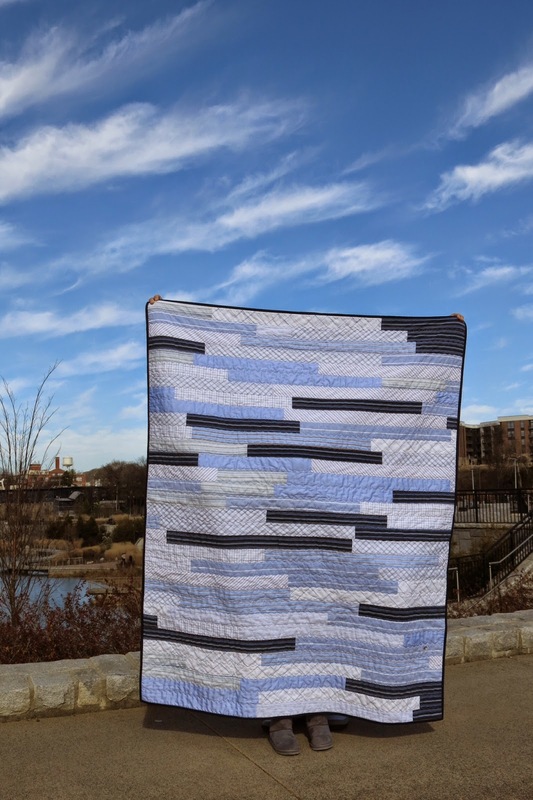 I love how all the blues work together and the quilting just adds another dimension of pattern and texture. and I felt like using the same thread color throughout unified the design. So now it's all crinkly and soft and ready to go home! Feeling really thankful for the opportunity to make these wonderful quilts. Preheat oven to 350. Spray or foil line and spray a 9"x13" pan (I use foil and spray - makes the bars super easy to remove from the pan and cut). Blend the cake mix, brown sugar, eggs melted butter and vanilla in a large bowl on low speed until well mixed. 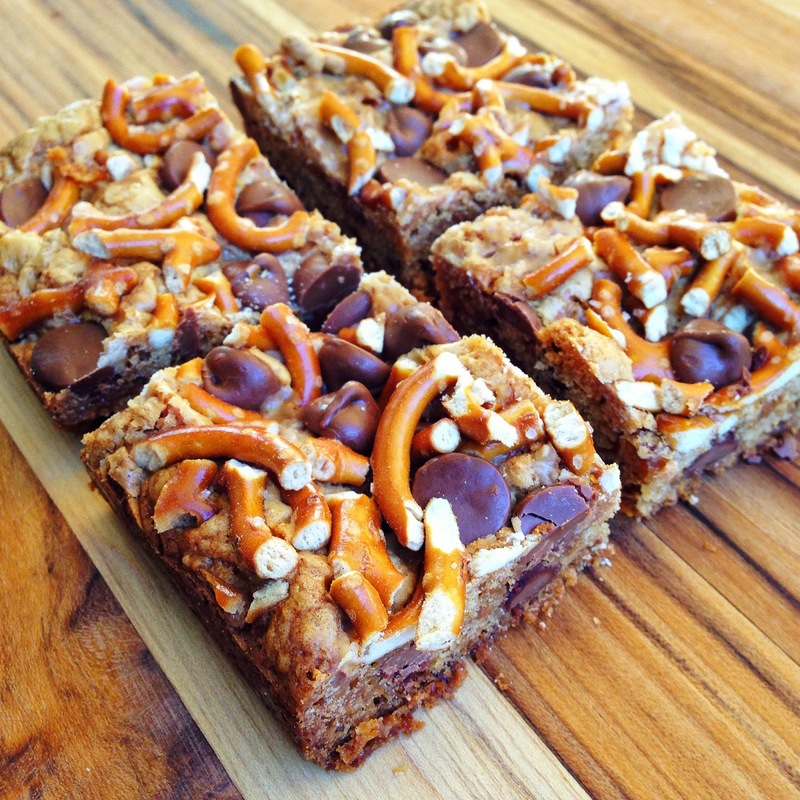 Stir in chocolate chips and toffee bits. Spread dough in prepared pan with a spatula - it will be stiff and you'll think it won't spread enough to cover the whole pan. It will. I started with a bag each of chocolate chips and toffee bits and used the extra (along with the crushed pretzels) to sprinkle the top with before baking. Bake about 25 minutes - bars will crisp up as they set so don't over bake (should be golden brown but still soft). Let cool and cut into bars. Amanda Jean posted recently about wanting to conquer of her "someday" quilts by working on a block a day until she got it done and I was instantly in love with this idea. I usually try to eat the whole elephant in no more than three bites, which ends up exactly as you can imagine, so the idea of smaller and slower seems foreign and brilliant to me all at once. I also joined That Stash Bee and picked a MEGA sting block as my block for January. After I made my sample block I was hooked and I started on them as my first block of the day project. You guys! It's so awesome. I try to make my block first thing in the morning and I have such a feeling of accomplishment from checking it off the list each day. And after only a little more than two weeks I had enough blocks for my first top! Here are the two sizes of blocks I've been making (I started on another quilt already). The left is 19" and the right is 15.5". I use muslin as my base and a 2.5" Kona White string for the center of each block. This is a GREAT scrap project but I've also been cutting all my random fabrics into strips too. Just FYI: from one fat quarter (cutting the strips so that they are all 22" long) you get exactly three 1.5", three 2.5" and three 2" strips with no waste. Obviously you can do this with a half yard as well and the strips are then WOF in length. I decided to try the 15.5" squares because they take less fabric and are a little more practical (1 yard = 4 blocks where 1 yard only equals 2 of the mega blocks). The string length is also more practical for the smaller blocks - you only need 22" to go diagonally across which means you can use FQ's for strings (the mega blocks need longer strings across the center which means they need to be cut from selvedge to selvedge). The smaller blocks also give more layout options. I'm thinking I'm going to do a 4x5 layout for these blocks, which should give me a 60"x75" quilt. I start by cutting all my strips and base squares so it makes each day's sewing really easy. I've been posting my block-a-day progress on Instagram. These blocks are just pure happiness to me! This is the 4x4 block layout and I loved it too. Fortunately I still have my Bee blocks to receive and a million strings cut so I have no doubt there will be another of these made. Thanks for stopping by! I've been working on a couple commissioned quilts made from works shirts and this is the first of the two. I cut large blocks from the shirt backs (which you'll see in the second quilt) and I cut the arms and fronts into 2.5" strips so a jelly roll type quilt seemed like a good fit. I'm so pleased with how it turned out! I love the idea of repurposing clothing to make quilts, kind of a back-to-the-future type of quilting. 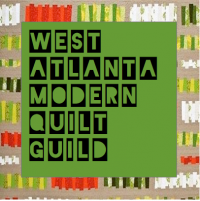 It also reminds me of what the Gee's bend quilters did - when I saw that exhibit years ago I fell HARD in love with a quilt that one lady had made of her deceased husband's old work clothes. 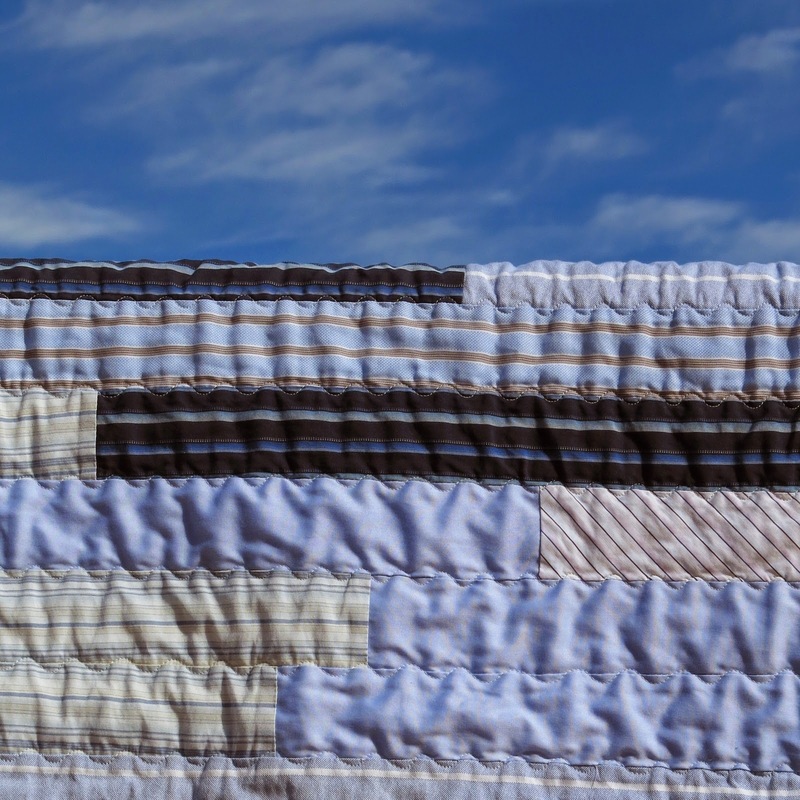 She was literally wrapping herself in his love and memory, which seems like the highest level of comfort and function any quilt could aspire to. This quilt has flannel on the back and was quilted with a wavy line to balance all the straight lines. Bound in a navy blue to contrast with all the light blues of the shirt. This week my number one project to finish was my mini quilt for the Schnitzel and Boo mini quilt swap (largely done through Instagram but also through Kristi's blog). My partner said she liked purple, lime, turquoise and Kaffe - I don't think I could have squeezed much more of those into this little guy. It finished at 18.5" square and it's my own design. Flying off to it's new home today and where I hope it's enjoyed! 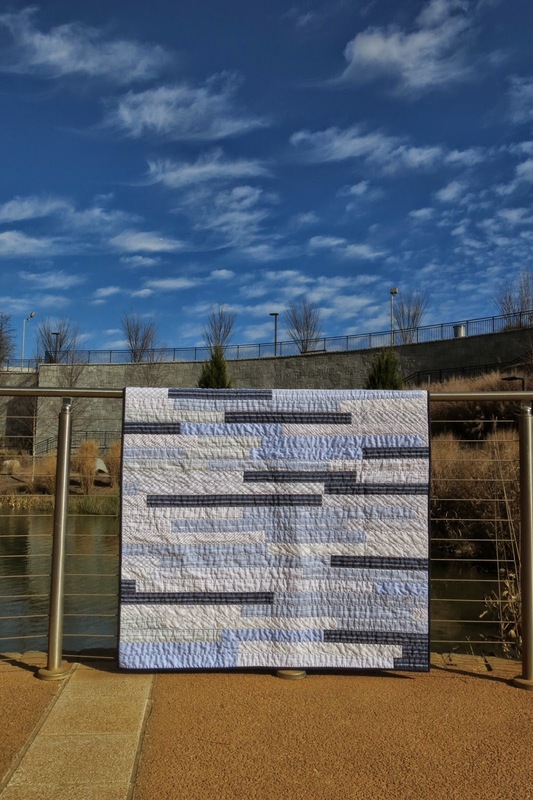 Linking up with Crazy Mom Quilts for my first finish of 2015.